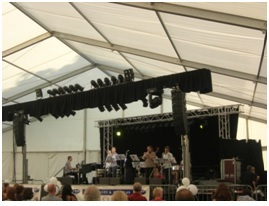 Each venue was packed out with 100’s of people enjoying the live music, in particular the ABD Priory Marquee where ABD Partner Wayne Elliott took guests along with ABD team Simon Lofthouse, Richard Bowater and Tom Paget. Friday evening events began with “Georgie Fame” opening the festival in the presence of the Mayor and Mayoress of Marlborough Councillor Guy Loosmore, with his fiancée Fiona Lawson outside the Castle and Ball Hotel. A FULL HOUSE - ABD PRIORY MARQUEE HITS THE SPOT! 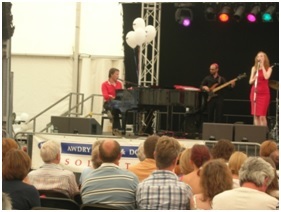 Mr Fame then went on to sing with Alan Skidmore quartet in the ABD Priory Marquee after The Red Stripe Bands amazing performance with Neil Drinkwater on piano and vocals. BBC Radio presenter and singer Clare Teal was back by popular demand, this time bringing with her Leeds Big Band. A Seriously fantastic extravaganza!! Towards the end of her show, Clare introduced and sang a duo with Ben Cipolla a local “Priory Gardens busker” with a fantastic voice who Clare had got to know over the years. Watch out for this new kid on the block – he may be performing at Marlborough Jazz Live 2014! 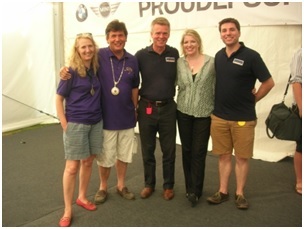 Left to right; Mayoress of Marlborough Fiona Lawson, Mayor of Marlborough Councillor Guy Loosmore, ABD Partner Andrew Douglas, Clare Teal and ABD Solicitor Simon Lofthouse. Jive Aces – the UK’s No 1 Jive and Swing Band with the Satin Dollz swung into action and shook the house down with some “hot” music”. The Adam Winslet Band which is an eight piece band, comprising vocals, guitar, drums, keyboards, bass, sax, trumpet and trombone, ended the evening with some soothing funk, rock and soul which went on into the late balmy night. The marquee was packed out! 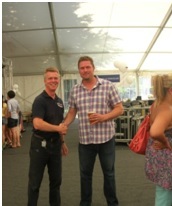 ABD Partner Andrew Douglas meets Adam Winslet! Winner of the 2013 MOBO award for her current Album “Kindred Spirits” pianist Zoe Rahman and her quartet provided a gentle afternoon delight of contemporary jazz. The afternoon ended with Cubana Bop, playing jazz on the Latin side!! 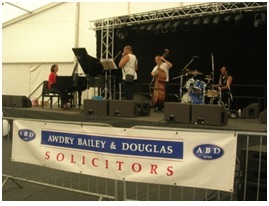 ABD was proud to be a sponsor of this amazing festival which just gets better and better. Roll on next year!! ABD were delighted to announce the opening of their new offices in Chippenham earlier this year, and celebrated this recently by having a much awaited office opening party. Henry Godwin Awdry, father of ABD’s present senior partner, Tony Awdry, had started in a legal practice in Chippenham with his cousin Daniel Awdry but began to assist with the legal practice in St John’s Street, Devizes, then known as Jackson & Jackson, at the rear of No 33. This was in 1948 and Henry Awdry joined the Devizes firm as a Partner the following year. When Guy Jackson passed away in 1953, Henry Awdry’s move to the Devizes firm became a permanent fixture. 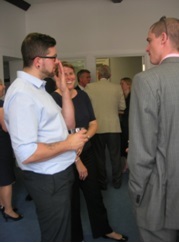 Drinks and canapés were served as people arrived to chat and also explore the new offices. Guests included The Mayor of Chippenham, Councillor Sylvia Gibson who is the 30th Mayor of Chippenham as well as local business people from the Town and surrounding areas. 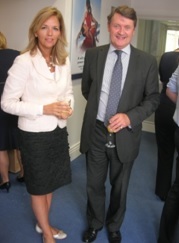 Top left to right: ABD Partner Tony Awdry with Ruth Wilkinson (Chesterton Humberts Estate Agents). 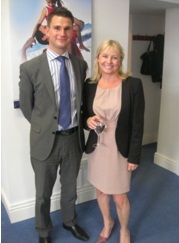 Tim Hotchkiss (ABD) with Sian Swift (Guyers House Hotel). Bottom left to right: ABD Partner Alex David with Rob Hunt (Ferris and Culverwell). Chris Bonsor (Bridge Brasserie), Sarah Walker (ABD) and Steve Smith (Bridge Brasserie). The President's Dinner and Awards Ceremony is an annual event. This year it was held at the delightful Stanton House Hotel, near Swindon on Friday 28 June 2013. 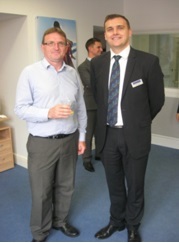 Guests included Andrew Caplen, Law Society Deputy Vice President. 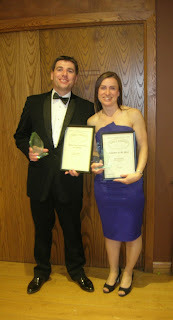 Simon Lofthouse who joined the firm in June 2010 as a trainee solicitor was awarded the Wiltshire Law Society Young Solicitor of the Year 2013 for Wiltshire. Simon was nominated for this special award because of his involvement in ABD's ground-breaking department "abdcare" which specialises in asset protection for the elderly, together with his charity work in the community. As well as receiving the Law Society Award, Simon was also given a "Kindle Fire" by Severn Trent Searches, sponsors of the award. Rachel Fereday who trained at the firm and qualified as a solicitor in 2005, becoming a partner of the firm in 2012, was awarded the Gloucestershire and Wiltshire Solicitor of the Year Award 2013 for her outstanding commitment to the profession. As the winner of this category, Rachel has been put forward to the National Law Society Excellence Awards which will be held at the prestigious Park Plaza Hotel, Westminster Bridge, London on Tuesday 22 October 2013. We wish Rachel well in the nomination for the National Solicitor of the Year Award.